Chocolate can come in many forms but at a basic level it comes down to cacao and how much of it you like vs sugar. If you like 75% chocolate, then you’re 75% cacao, 25% sugar. In my research this week I found a simple how to video on making your own chocolate from scratch so I thought it would be fun to make my own chocolate and test out what percentage I like best. When I started this week I hadn’t planned on actually making chocolate from scratch but it’s really easy and worth a weekend experiment. It only takes about 10 minutes all in. 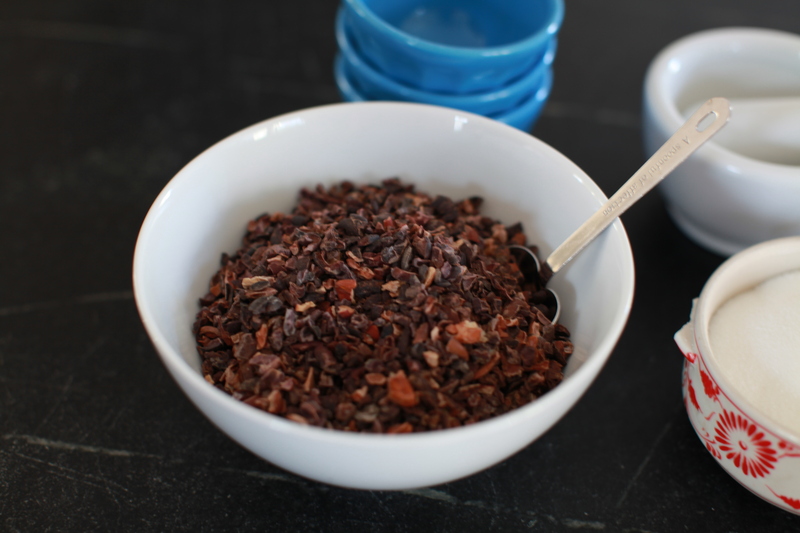 You start with cacao nibs which I found in the bulk section at Whole Foods. They also suggest using Dagoba Nibs. They are about $13/lb. The only other ingredient is sugar. small coffee grinder – I used my small Cuisinart, but they recommend a simple burr coffee grinder. You want a grinder that keeps the nibs contained as it’s grinding rather than pushing it through to a compartment below because it has to grind for about 5 minutes. 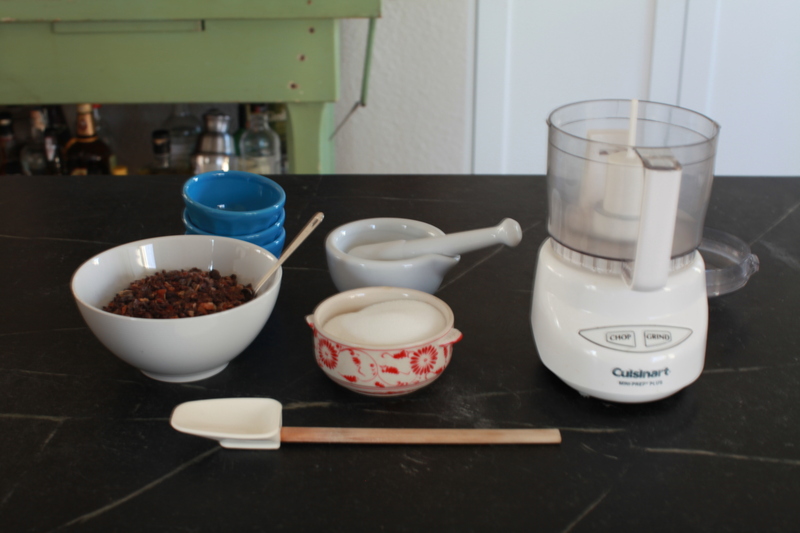 Start by adding the ratio of cacao nibs to sugar into the grinder. I started with 80%, so 8 teaspoons of cacao and 2 teaspoons of sugar. You’ll have to wipe down the sides as you go along since it will start to form a paste and stick to the sides. After your 5 minutes it will be a paste that has some shine to it almost as though you’ve added a little liquid. (Similar to peanut butter in texture). You transfer it to a mortar and pestle and continue grinding and folding the chocolate for another couple minutes. You have to put some muscle into it. I made 3 different batches to try out from 80% down to 60%. I was partial to 70% and even could have gone a bit sweeter. It was a little grainy still but that probably had to do with not using a fine grinder. I ended up mixing some 70% with some 60% to make some hot chocolate and strained it through a fine mesh strainer. It tasted much fresher in a way, similar to how good a freshly ground cup of coffee tastes compared with already ground beans. People always ask me what my favorite weeks of the year have been. Hands down roasting my own coffee has been one of them that I’ve continued doing and will continue doing. After this little experiment in making my own chocolate I’m now curious about taking a step further even and seeing about roasting my own cacao beans. I came across a site called Chocolate Alchemy which is the equivalent to chocolate what Sweet Marias is to coffee. I may have to give it a shot! You are currently reading Making Your Own Chocolate at 52 To Do.